Anyway yesterday after thinking for quite some times about what to cook for dinner, I got myself referring to quite a very long recipe for such a very simple meal. What elso if not Chicken Rice the most common favorite food to everyone! 😉 Mind you it is neither the rice for the chicken nor rice made of chicken okay! Even though it was the nth times for me cooking chicken rice but that was the most marvelous and successful chicken rice I have ever cooked. The last times was very delicious too but yesterday’s was the best, not only because of the tastes but also the smells, textures, and colors of each of the chicken rice’s portions. Thus, the combination of each portion really gave us a blast during the dinner time :D. I managed to prepare all the complete set within 1 hour. I believed I could make it less then that if the chicken legs were already cleaned and cut. I learned to make chicken rice from my mom and mom-in-law, and I did modify the recipe to suit my taste so now it is my-own-chicken-rice-recipe-to-be right? I’m not going to put the recipe here as for now I am soo lazy to write the long recipe. But if anyone wants it just message me later and I will make an effort to give it to you 😀 Ouh by the way you can also refer to other Malaysian food websites and I’m sure you will find the recipe for chicken rice (but of course it will not be the same as mine muahaha) ;). 1. Pour in 1/2 tbsp cooking oil into a big pot. Add in garlic, ginger, cinnamon stick and star anise. Fry a little bit until fragrant. 2. Place the chicken pieces into the pot then add in water to cover the chicken. Add in salt and the sup bunjut then let it boil. 3. Once boiled, remove the pot from heat and remove the chicken. 5. 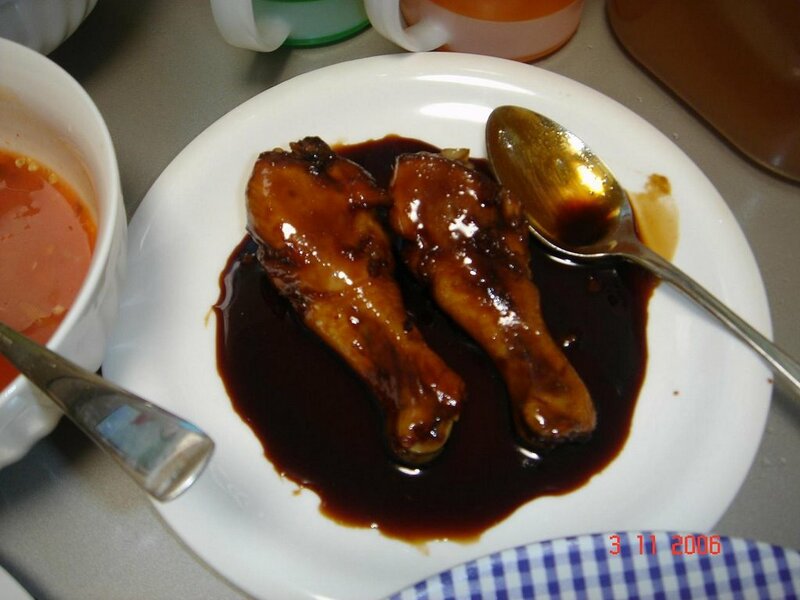 In a frying pan, marinade the chickens with honey, sugar, thick soy sauce and oyster sauce for at least half an hour. 6. Fry on slow heat to avoid the chicken from getting burnt, until the mixture of soy sauce becomes sticky. 7. Once fried, it is ready to be served. Note: Actually I cooked the chicken soup using my grandmother’s recipe. She said be careful not to put many or big star anise, onions are not really needed, and put in many garlic. But still until now my chicken soup can’t really imitate her delicious chicken soup hehe. Ouh I served the chickens altogether with the soy sauce. Easier and save time too =D. 1. Wash rice and put in a strainer. 2. Put the rice into the rice cooker pot. 3. Add in the chicken soup/ chicken stock. 4. Add in all other ingredients then stir the rice a little bit. 5. 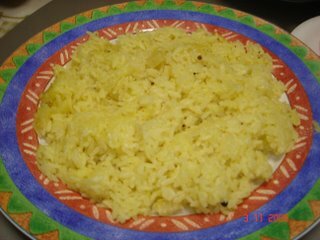 Let the rice cooked in the rice cooker. 6. Once cooked, stir the rice a bit so that it mixed well. Note: As for me since I’m using Japanese rice, so I measure the water level first so that I won’t pour in chicken soup more than it should be. 1. Add in 1 cup of chicken soup into a bowl. 2. 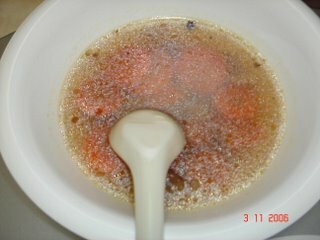 Add in all other ingredients and stir till well mixed. 3. Ready to be served. 1. Add carrot to the left chicken soup after preparing the A), B) and C) as above. 2. Add in some crispy fried onion and salt then boil until the carrots are soft enough. 3. Remove from heat. Add in celery and sprinkle some more crispy fried onions. 4. Ready to be served. Note: I think by adding the fried onion, that made the soup more delicious. Note: I just served cucumber and tomatoes since I didn’t have any lettuce. The chicken rice looks yummy!! Yup Syana, Japanese rice is quite like glutanious rice. So as for me what I normally do is, I will be extra careful not to exceed the water limit if not it will easily become porridge. As for Malaysian rice it is still okay to exceed the usual water limit. Ouh I add in some butter so that the rice wont be sticky =D. Put on the recepie soon will ya?! Btw, what are you doing in JP? Student there? That’s cool! I am supposed to fly after graduating from UPM but then I cancel the thoughts .. now rasa rugi pulak! Anyway, Tq for the recepie! Will try it! Beckhamel: Even though u tak fly but now u r already working for good. Takpe nnt if ada chance lagi n ada rezeki boleh la u fly kan InsyaAllah =D As for me have to ikut hubby n now susah lor nk keje kt JP. 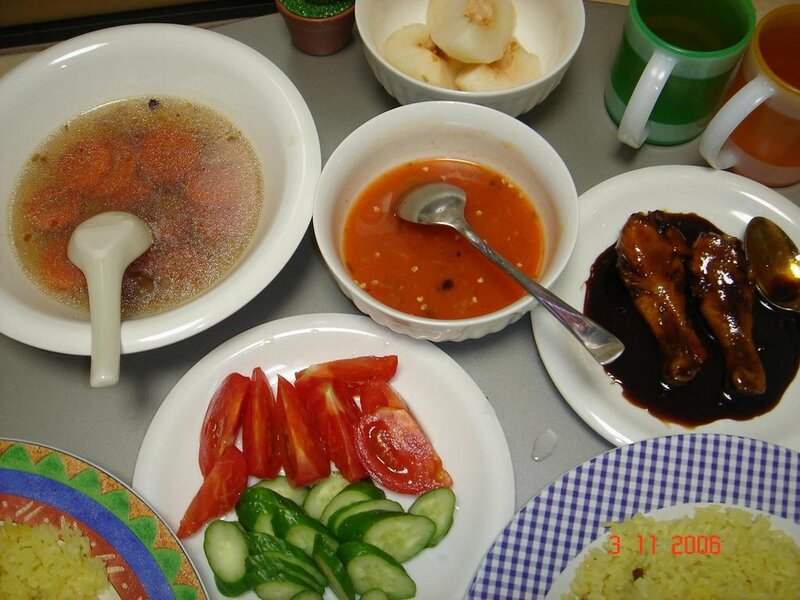 Jauh from family plak tu isk isk..
wah wah…ina memasak! tiba2 perutku berbunyii plakk..
oh when is lunch timmeeee!! ?